Rio Ferdinand, James McVey from The Vamps, Marcus Butler, Jessie J, Riyadh Khalaf amongst a host of other celebrities support #Back2School. MP’s from all parties, across the UK, join the campaign. This September sees over 10 million children going back to school, with many feeling anxious about being bullied and over half of them will be affected by bullying. A recent survey of nearly 2,000 adults about their experiences of bullying in school and the workplace, conducted by YouGov for The Diana Award, reveals the shocking impact it still has on their lives today. Over 64% say it’s negatively affected their confidence and 60% their self-esteem. 35% say it has negatively affected their ability to trust other people and 35% believe that bullying behavior occurs in their current place of work. The Diana Award runs the leading Anti-Bullying Campaign in the UK giving young people, professionals and parents the skills, confidence and training to tackle all forms of bullying as Anti-Bullying Ambassadors. 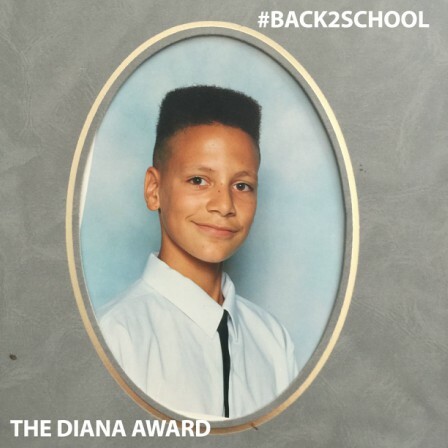 To kick-off the month’s #Back2School campaign, The Diana Award Anti-Bullying Campaign is encouraging everyone to get involved across social media channels by posting/sharing a picture of them back at school with their adive and if they choose to, text a donation to support the training of young Anti-Bullying ambassadors in every school. The #Back2School website campaign page launches today, Monday 5 September: www.antibullyingpro.com/back2school2016. As well as reliving their personal experiences of being bullied, celebrities will give their advice and raise awareness of the need for Anti-Bullying Ambassadors in every school. The Diana Award is also providing #Back2School advice and support online and through their social media channels. “Young people spend 11,000 hours of their lives in full education. School should be safe and free from bullying. We’re urging everyone to get behind our campaign by helping us to train Anti-Bullying Ambassadors in schools. We know this peer to peer campaign works and these young ambassadors are already changing behaviours and shaping attitudes by sending a clear message that bullying isn’t acceptable. Our vision with the help of the public/nation is to reach every one of the 27,000 schools across the UK”. MPs from England, Scotland and Wales supporting the campaign include: Julie Cooper, Karin Smyth, Andrew Stephenson, Stuart McDonald, Neil Gray, Rosie Cooper, Owen Thompson, Stephen Kinnock, Theresa Villiers, Sam Gyimah, Johnny Mercer, Richard Benyon, Julian Knight, Peter Grant, Alan Mak and Paul Flynn. Not having a care in the world, enjoying school, enjoying my mates and playing football and interacting with all the other kids in the school. Good times! Tell us about your experience of bullying at school? When I a kid I was training at a football club one of the other guys said some racist words to me while we were playing. Fortunately the coach at the time heard what was said, asked me what happened and I told him and the boy was asked to leave the club. I was lucky that the coach was responsive and reacted to the situation in the right way. I was lucky. Adults that respond and react to racism and bullying are so important. It got me upset, I was angry, but I had always been told and taught by my parents how to react and respond to situations like that and it was through showing them that you are bigger and better than what they are doing and going and telling an adult. I was lucky to be in the position and around an adult that could deal with it properly. What is it like to be treated differently? When you go into a new situation, I went to a new football club, new changing room, new football club and you’re the Centre of attention people can dig you out. I remember I went to West Ham once for training and the first time I went there one of the boys said to me, ‘you’re rubbish, why you got that kit on’? Because I was wearing a different kit. You either sink or you swim. I decided I was going to play as hard and as good as I can and hopefully get the kid out of the team and eventually I did. Did you stand up for others at school? I was always quite popular at school and had friends. I had experience at school of seeing other kids getting bullied and being pushed around and stuff. I didn’t like to see that, I hated bullying, I would go in and try and sort the situation out myself without getting physical or go and find a teacher and tell them. What’s your advice as a parent? I’ve got young kids now- 9, 7 and 5- I don’t want to see them being bullied, but I also stress to them I don’t want to see you bullying anyone. Tackling bullying within a school environment is huge- it can ruin a kids’ younger life, teenage life, it can really dampen their appetite to want to learn and want to attend school. I think at home it’s really important to give your kids confidence to walk into a school, walk into a school and be comfortable in their own skin and if they have something that other people might find quirky and be able to deal with it, sometimes with humor and sometimes face on. What difference would an Anti-Bullying Ambassador have made? An Anti-Bullying Ambassador in my school would have been someone that most of the kids would have been able to go to and talk to. Someone like me, who was in with a lot of the people, quite easy to talk to and somebody that would deal with bullying in the right way and react the right way, either having a quiet word with the teacher so they sort it out or I would have gone straight in and talk the situation down. You need someone with a good temperament. And in the end that person would be respected throughout the school and be respected for being involved in such a good cause. What is your back to school advice to any young people worrying about going back to school because of bullying? So there are millions of kids going back to school, what you gonna do? Are you going to go in with your head down or go in with your chest out, head high? I know what I’d do, I know what I did. I went in with my chest out, head high. So make sure you do that and make people know that you’ve got the confidence to walk into that classroom and be amongst all your peers, and all your friends and you’re all equal, so enjoy it- it’s only school.